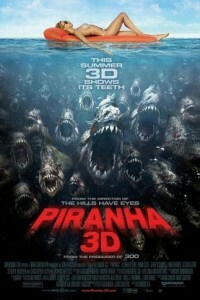 “Piranha 3D” – “What do they really eat?” – “You mean besides flesh and blood?” Jaws… lots and lots of jaws. From acclaimed director Alexandre Aja (The Hills Have Eyes) comes the new action thriller “Piranha 3D,” in the latest eye-popping 3D technology. A new type of terror is about to be cut loose on beautiful Lake Victoria. After a sudden underwater tremor sets free scores of the prehistoric man-eating fish, an unlikely group of strangers – including hot local cop Julie Forester (Oscar winner Elisabeth Shue) – must band together to stop themselves from becoming fish food for the area’s new razor-toothed residents. But our heroine is seriously outnumbered, and with only one chance to save the lake and her family from totally being devoured, she must risk everything to destroy the aquatic carnivores herself. Oscar winner Richard Dreyfus also stars. As does the adorable Jerry O’Connell – see photo below.